Since we first discovered Poppy Cat, she has become a firm favourite in the mellow household - a children's TV programme that we ALL enjoy watching and a set of books that capture all of our imaginations. The latest two Poppy Cat books are designed to tie in to the TV series and are perfect 'First Storybook' style for toddlers who are just beginning to get to grips with sitting patiently and listening to a whole story. 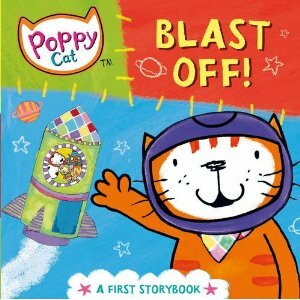 Poppy Cat, Blast Off! is one of a pair of new books (the other is about pirate fun and is entitled All Aboard!). Blast Off! is a hard-cover board book with thick pages and is designed for children too young to read but who enjoy having a real story read to them, not just pictures with a couple of words dotted about. Blast Off! has a short story all about exploring space. The book features all of our favourite Poppy Cat characters - Elmer, Zu zu, Mo and Owl as well as the very cheeky Egbert who this time is dressed up as a space monster. The friends explore their weightlessness, survive an asteroid storm and manage to prevent themselves floating off into space. The colours are bright and the illustrations are fun. In our household, Holly (6 months) and Lara (3.5 years) enjoy the book just as much as one another and get two totally different things from it - visual stimulation as well as a short but engaging story. Poppy Cat Blast Off! was the creation of Lara Jones and costs around £4.99.